Visitors to an Ikea in Toronto had to finish their Christmas shopping with some unexpected company this past weekend. 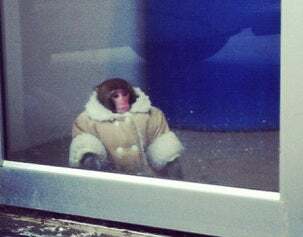 A small, but stylish, monkey wearing a shearling-like winter coat was found on the loose and alone in the store's parking lot after escaping the confines of its owner's cage. The monkey was eventually lured into the store by Ikea staff, where it awaited capture by animal control. The owners, who were shopping in the store at the time, have since been charged $240 for keeping a prohibited animal. As you might expect, the owners were not able to take the monkey back home.